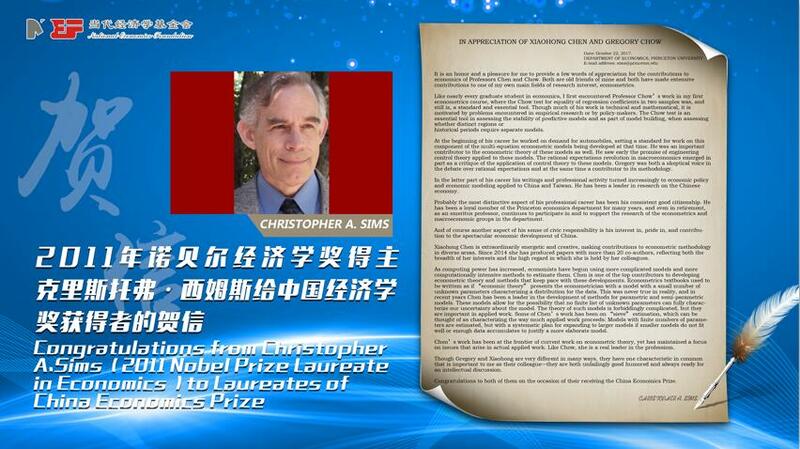 It is an honor and a pleasure for me to provide a few words of appreciation for the contributions to economics of Professors Chen and Chow. Both are old friends of mine and both have made extensive contributions to one of my own main ﬁelds of research interest, econometrics. Like nearly every graduate student in economics, I ﬁrst encountered Professor Chow’s work in my ﬁrst econometrics course, where the Chow test for equality of regression coefﬁcients in two samples was, and still is, a standard and essential tool. Though much of his work is technical and mathematical, it is motivated by problems encountered in empirical research or by policy-makers. The Chow test is an essential tool in assessing the stability of predictive models and as part of model building, when assessing whether distinct regions or historical periods require separate models. At the beginning of his career he worked on demand for automobiles, setting a standard for work on this component of the multi-equation econometric models being developed at that time. He was an important contributor to the econometric theory of these models as well. He saw early the promise of engineering control theory applied to these models. The rational expectations revolution in macroeconomics emerged in part as a critique of the application of control theory to these models. Gregory was both a skeptical voice in the debate over rational expectations and at the same time a contributor to its methodology. In the latter part of his career his writings and professional activity turned increasingly to economic policy and economic modeling applied to China and Taiwan. He has been a leader in research on the Chinese economy. Probably the most distinctive aspect of his professional career has been his consistent good citizenship. He has been a loyal member of the Princeton economics department for many years, and even in retirement, as an emeritus professor, continues to participate in and to support the research of the econometrics and macroeconomic groups in the department. And of course another aspect of his sense of civic responsibility is his interest in, pride in, and contribution to the spectacular economic development of China. Xiaohong Chen is extraordinarily energetic and creative, making contributions to econometric methodology in diverse areas. Since 2014 she has produced papers with more than 20 co-authors, reﬂecting both the breadth of her interests and the high regard in which she is held by her colleagues. As computing power has increased, economists have begun using more complicated models and more computationally intensive methods to estimate them. Chen is one of the top contributors to developing econometric theory and methods that keep pace with these developments. Econometrics textbooks used to be writtem as if “economic theory” presents the econometrician with a model with a small number of unknown parameters characterizing a distribution for the data. This was never true in reality, and in recent years Chen has been a leader in the development of methods for parametric and semi-parametric models. These models allow for the possibility that no ﬁnite list of unknown parameters can fully characterize our uncertainty about the model. The theory of such models is forbiddingly complicated, but they are important in applied work. Some of Chen’s work has been on “sieve” estimation, which can be thought of as characterizing the way much applied work proceeds: Models with ﬁnite numbers of parameters are estimated, but with a systematic plan for expanding to larger models if smaller models do not ﬁt well or enough data accumulates to justify a more elaborate model. Chen’s work has been at the frontier of current work on econometric theory, yet has maintained a focus on issues that arise in actual applied work. Like Chow, she is a real leader in the professiom. Though Gregory and Xiaohong are very different in many ways, they have one characteristic in common that is important to me as their colleague — they are both unfailingly good humored and always ready for an intellectual discussion.